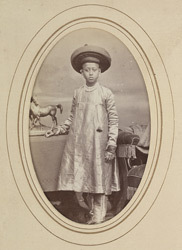 BAVDA: Madharao Moreshwar, Chief of Bavda (b.c.1859). bl.uk > Online Gallery Home	> Online exhibitions	> Asia, Pacific and Africa Collections	> BAVDA: Madharao Moreshwar, Chief of Bavda (b.c.1859). Full-length standing carte-de-visite portrait of Madharao Moreshwar, Chief of Bavda (b.c.1859) from the 'Album of cartes de visite portraits of Indian rulers and notables' by Bourne and Shepherd, early 1870s. Bavda in Maharashtra was a petty Cheifship feudatory to the Kolhapur state.